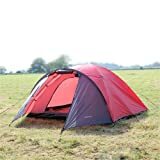 If you are shopping around for four man tents or five man tents then you might have missed this one, since it doesn’t sport the huge amounts of communal space that make dome tents so popular…at least not at first glance. Upon closer inspection, however, you might find that it is a treasure, with more than a few interesting features that are all thoughtfully and tastefully designed to make your camping life easier. In June 2017 this tent was rated best for bad weather by the Daily Mirror, which should give you an idea of how protected and snug you are in this tent. It only features the one bedroom, which is why it often gets overlooked, but this bedroom is clipped on to the inner poles of the tent and suspended, giving you a much needed buffer between the fabric of the bedroom compartment and the outer fabric of the tent. This helps to increase waterproofing, keeps you from being too cold and allows you to add a layer of insulation if you want to, on particularly cold nights. This tent is fire retardant but only stands a meter and a half high, meaning head room is lacking. Unfortunately this model sacrifices a little in space for extra comfort, so the choice is yours. Where other tents might provide you with a little more living space they will, undoubtedly, be colder than the North Gear Mars. If you are on a family outing with your youngsters this tent is absolutely perfect. We would gladly sacrifice head room for our children’s warmth any day of the week. It can act as an excellent family tent. The North Gear Mars has fly screens and taped seams, plus waterproofing up to 3000 mm. It will keep you both dry and warm, providing the best in protection for those who need a large bedroom but are going camping somewhere cold. It does come with a zippered canopy to provide you with extra daytime storage space and, unlike many others, has tension adjusters to you can get a cosy nights sleep without having to worry about anything snapping in the night! • A canopy for extra storage space. • Fly sheets and air vents. • 130 cm in height. • Sleeps up to five. • Taped seams and waterproofing up to 3000 mm. • ‘Best for Bad Weather’ – Daily Mirror. So if you are looking for a snug and comfortable family tent then this could be the one for you. Likewise if you are going to a festival, or even just group camping, this tent will provide ample sleeping space for your adventure. Our only complaint is the lack of communal space.